WILSHIRE ROTARY LOT saw an increase in demand. By now the family Christmas tree may be on its way to being recycled or packed away until next year — and, like the end of the Hans Christian Andersen story — we all get a bit teary when saying goodbye to the cheerful holiday tradition until next year. The vacant lot at 568 N. Larchmont — which Wilshire Rotary turned into a wilderness of trees and an ersatz neighborhood park for a brief month — is now empty once more. However, at the end of last November, the now familiar tree lot that has set up shop since 2007 was a hive of activity as families from within and outside of the neighborhood purchased their trees, wreaths and boughs for holiday decorating. Children ran through the temporary forest, getting lost amidst the firs, looking for that one perfect tree. Parents followed, possibly noting the increased prices, but buying the trees anyway. And buying, and buying, and buying. 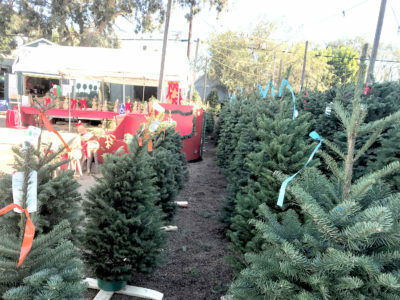 Both the “New York Times” and “Los Angeles Times” noted a shortage of trees in the Christmas tree market, along with an increase in prices due in part to the shortage and a hike in gasoline prices. Many tree lot owners have reportedly had problems finding enough trees to fill their lots, though David Hundley, spokesman for the National Christmas Tree Association said, “everybody looking for a real tree will be able to find one,” but the prices were higher. It was the increased demand. Even though the Wilshire Rotary increased its order of Oregon trees from last year, typically receiving 420 weekly, the lot still ran out the second Sunday it was open. Sandy Campbell of Citrus Ave. saw the December Larchmont Chronicle article and planned on getting a silvertip. There weren’t any available the Friday he dropped by, but the lot’s operators said they were getting a delivery the next day. Campbell decided to skip the crowds and wait until Monday to come back for a tree, but when he got to the lot around 9:30 a.m. on Monday, there weren’t any trees left. Walking to work the Tuesday morning after that weekend, I saw one lone tree in the lot. The shortage was quickly remedied, says Clifford, who said they upped their usual weekly order by 200, asking for delivery as fast as possible. By Tuesday night, following the sold-out weekend, just before midnight, a truck with a full trailer of trees pulled into the lot and parked. At 7 a.m. Wednesday morning, 600 trees were being offloaded. By Wednesday afternoon, as I walked home from work, I saw that the temporary forest was once again filled with families looking for the perfect tree, and I was told that another partial load of wreaths and boughs was on the way, to be delivered later in the week. A week later, 900 more trees were delivered. Numbers were approximate when we spoke, but Clifford said that the first Saturday in December had a 43 percent increase in sales over the same period last year. When asked what she thought was the reason for the increase, she pointed out the decrease in local neighborhood tree lots. This year, the only other choices for people to get real trees seem to have been places such as Home Depot, Pavilions, OSH and Whole Foods (though this year there was a “Mr. Jingles” tree lot in the former Johnny Rockets space at the Original Farmers Market). Delancey Street only had seven lots open this year, down from 10 they used to have (which previously included a Windsor Square lot at Wilshire and Irving Blvds.). When asked why they had fewer lots, the reply at Delancey was that they didn’t have enough labor to service all the lots. Other private tree lot proprietors may have lost access to vacant lots that are now being developed with housing. Whatever the reason, there was a marked increase in sales at the Wilshire Rotary tree lot this past Christmas season. The weekend the lot ran out was just one instance where demand exceeded supply. Clifford pointed out that the community is very supportive of the tree lot. Proceeds from the sale of the trees go to charities supported by both Wilshire Rotary and Rotary International. So, people know their money is going to a good cause as they return each year for the fresh trees. It has become a neighborhood tradition. Rachel Olivier’s apartment windows look out on the Wilshire Rotary lot.